(CBS Sports, by Katherine Acquavella, September 4, 2018) – There are some strange things that have happened in history of baseball. But a discovery made by Texas Rangers beat writer Levi Weaver may just be the strangest. Weaver posted a tweet with side by side headshots of two minor-league pitchers who happen to look nearly identical. The two pitchers both stand at 6-foot-4, are redheads with similar beards and wear uniform baseball spectacles. But that wasn’t the head scratcher. The two pitchers are both named Brady Feigl. And they’re not related. 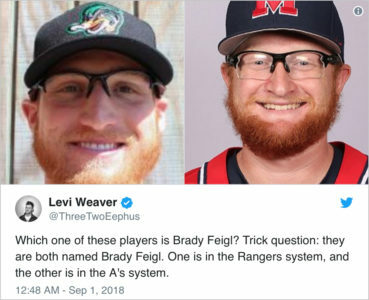 Right-hander Brady Feigl plays for a Single-A affiliate of the Oakland Athletics and left-hander Brady Feigl plays on the Texas Rangers’ Triple-A affiliate. Feigl of the Rangers played at Mount St. Mary’s while Feigl of the A’s played college ball at Mississippi. While Feigl was pitching for Ole Miss, the official Twitter account even got confused and tagged the wrong Feigl. If both these guys continue the climb up the minors, we could potentially see a Brady Feigl vs. Brady Feigl pitching matchup in the American League West. (Associated Press, September 4, 2018) – PALO ALTO, Calif. — Pediatric resident Brandon Seminatore was doing a monthlong rotation at the same neonatal intensive care unit where he was cared for as a newborn when he came across someone from his past. 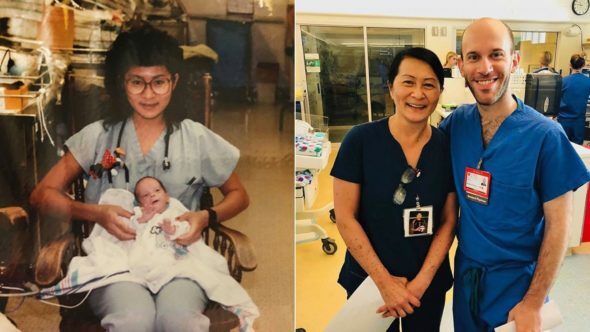 The East Bay Times reports Sunday that long-time nurse Vilma Wong asked Seminatore who he was when she saw him standing near an incubator wearing blue scrubs. She remembered caring for a baby with the same name whose father was a police officer. It turned out to be Seminatore, who is now training to become a child neurologist. The story of their reunion at Lucile Packard Children’s Hospital in Palo Alto has been shared thousands of times via social media. Seminatore weighed 2 pounds and 6 ounces when he was born in 1990.